The House of Representatives is expected to pass a resolution Tuesday to declare the violence against Myanmar's Rohingya a genocide, a move the Trump administration still has not made despite mounting evidence and a cavalcade of voices saying so. The resolution's expected passage is particularly striking because it brings Democrats together with House Republicans who rarely break with President Donald Trump on legislation or messaging. Republican House leadership pushed for the vote to come up before the end of the year, a House aide told ABC News, sending a signal to the White House that more should be done to punish Myanmar for the atrocities. The resolution also condemns the arrest of two Reuters journalists who helped uncover one of the Myanmar military's mass graves and calls for their immediate release. Wa Lone and Kyaw Soe Oo were arrested nearly a year ago on Dec. 12, 2017 and sentenced in September to seven years in prison for breaching a law on state secrets -- charges that have been roundly criticized and described as trumped up. Formerly known as Burma, Myanmar has long oppressed the majority Muslim ethnic minority Rohingya and other ethnic minorities. Starting last August, it began what the United Nations called a systematic campaign to eradicate the Rohingya and drive them from their homes into neighboring Bangladesh. 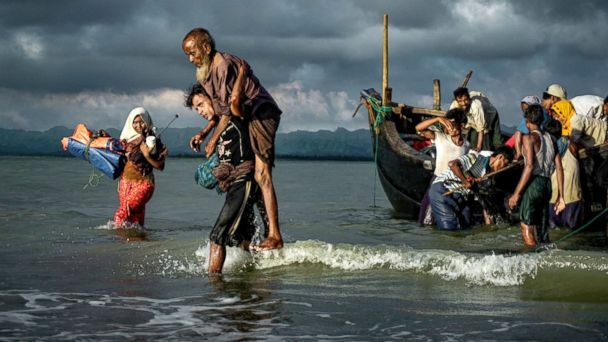 More than 700,000 refugees escaped to make the journey and joined hundreds of thousands who already lived in camps in Cox's Bazaar, Bangladesh. There are now close to 1 million there. Since then, the United Nations, the U.S. Holocaust Memorial Museum and others have labeled that campaign a genocide. Last November, then-Secretary of State Rex Tillerson called it "ethnic cleansing" and ordered a detailed investigation into what occurred, the scope of which was unprecedented. But after investigators interviewed over a thousand Rohingya and provided their detailed report to the State Department, Secretary Mike Pompeo never made a genocide designation. Instead, he quietly released the report in September, with its grisly, detailed account of what happened and no legal determination. Even after the law firm that helped conduct the department's investigation made their own genocide determination last week, there was no change in its findings. While Trump administration officials like Vice President Mike Pence and U.S. Ambassador to the U.N. Nikki Haley have spoken forcefully about the violence, critics say their label of "ethnic cleansing" does not do enough, especially because that term is not defined by international law and is seen as a lesser charge. Genocide, on the other hand, is defined by the Convention on the Prevention and Punishment of the Crime of Genocide, a 1948 treaty signed by the U.S. and other countries after the Holocaust. It defined genocide as killing, harming or seeking measures to prevent the births or transfer children of a national, ethnic, racial or religious group with intent to destroy them entirely or in part -- although the treaty is unclear about what, if any, real legal responsibilities signatories like the U.S. have to act on it outside of their borders. The last time the U.S. declared a genocide was in March 2016. The Obama administration declared the Islamic State's violence against Iraqi religious minorities a genocide, but determined it did not obligate them to take further action. "It is time we call these atrocities against the Rohingya what they are: genocide," said Rep. Steve Chabot, R-Ohio, in a statement in September. He even cited the State Department's own report, saying, "If this determination wasn't obvious before, the recent report ... should leave little doubt in anyone's mind. The perpetrators must be held accountable." Chabot introduced the resolution being considered Tuesday with a bipartisan group of cosponsors, including the top Republican and Democrat on the House Foreign Affairs Committee, Rep. Ed Royce of California and Rep. Eliot Engel of New York. While the legislation has faced some stops and starts, including a delay last week because of former President George H.W. Bush's funeral, it finally got its vote at the request of leadership like Royce, a GOP House aide said. The State Department did not respond to a request for comment on Tuesday's vote. "Every day the United States stalls and drags its feet to make a legal determination -- despite multiple opportunities -- makes the U.S. complicit in covering up what actually happened," Francisco Bencosme, Amnesty International's Asia Pacific advocacy manager, told ABC News. "It is clear, from what has been reported, that Trump's policy on Myanmar is paralyzed and failing to help alleviate the suffering of the Rohingya." The U.S. has provided nearly $300 million in aid for Rohingya refugees. But Myanmar's government has blocked humanitarian access to the northern Rakhine state, where much of the violence took place, in part to prevent international investigators from collecting evidence and accessing Rohingya victims and villages. Still, a genocide determination by the U.S. could galvanize international action to investigate Myanmar's atrocities. "By passing this bill in the House, Congress is going on the record with the kind of moral clarity and leadership worthy of such an institution," said Bencosme. While the House takes action, the Senate has yet to hold a similar vote on the Rohingya crisis. That's in part because of the close relationship between Senate Majority Leader Mitch McConnell and Myanmar's top civilian leader Aung San Suu Kyi, a longtime political prisoner and Nobel Peace Prize laureate who was eventually freed from house arrest and allowed to join the new civilian-military, power-sharing government. Suu Kyi has dismissed criticism of the Rohingya crisis, in particular telling Pence last month that her government better understands their country than outsiders like the U.S. That's spurred a global outcry and public rebukes by the human rights groups that once lauded her as a democracy icon. But McConnell has spurned that criticism, dismissing it as a "pile-in" that "hasn't done any good," in an interview with Reuters in October, "I just don't think joining that and further undercutting the best hope we have for genuine Burmese democracy in the future is good policy." McConnell's intransigence has upset some House Republicans, who say amid the administration's silence, a similar resolution from the Senate would be welcomed.